1996. The year that I first played Star Trek: The Customizable Card Game. Now, I know that this is ostensibly an article on the latest Second Edition (2E) card to be spoiled, but I feel like a bit of indulgence if nobody minds, and take a quick wander through memory lane. This is, after all, a celebration of 20 years of this CCG. Which brings me back to 1996. Introduced by my friend Doug, or known as gtdoug on the boards, we played casually for several years before attending our first tournament proper. We had such a poor grasp of the rules and strategy (some might say we still do!) that we really didn't know what we were doing. I was a big fan of Klingons in First Edition (1E). When we did eventually get to our first tournament, my very first sanctioned game was a disaster... I played one Klingon, then Mark Radford went and took a 35 minute turn, I played one more card, then Mark won on his 2nd turn. The rest of the day went just as well. Yay? But Doug and myself continued attending tournaments, not because we had any ability to play 1E, but for the social aspect. I expect a lot of the older players still around may remember Team London from the turn of the century; there was an amusing blog series entitled Ruling Brittania which proved popular, and a less than friendly rivalry with Team Jersey, in particular with John Corbett. That rivalry still exists, although it's certainly more friendly now... mostly. Team London members included James Farmer, Ringo Greenwich, Howard Kendrick, Mike Shanny, Marcus Sheppard, Ian "Pie" Taylor, and Steve Tobin. We don't mention DT. Aside from Doug and myself, Matt Slade, Stuart Marsh, and Mark Radford would eventually carry over from the old days to continue playing in 2E. After every tournament we'd head to Pages Bar in Westminster, a Star Trek themed bar with karaoke. We had some great times there. After that closed down, we ended up going to the Purple Turtle in Camden. That was a great bar, they had a set of stocks which I once got locked in and some cheeky young lady removed my trousers. There was also a Star Trek connection with that bar, as Simon Pegg and Nick Frost both used to drink in there as well, but not being famous at the time, I have no idea if we ever saw them! Then there was the time we went to a school disco, involving violence, blood shed, and me losing a tooth. But then... disaster! Decipher stopped producing 1E. No more tournaments. The team drifted apart (although we have gathered occasionally since, for my Stag Night as one example - that story needs to be told). I put my cards away and forgot about the game for awhile, at least, until Decipher released Second Edition. Aside: There have been issues around James Hoskin in the last year, that everybody is aware of, but without James there would have been no 2E in London. He was the Decipher Ambassador, and worked hard to arrange tournaments and demo games. Despite everything, Second Edition, as it stands today, owes a lot to James. So – Second Edition tournaments were taking place; the player group had dropped from twenty-five to around seven or eight, but at least it was still continuing. There was an issue, one that was affecting me; the premiere set was a great starter set, but lacked something. It was too basic, but then was only the first set. The second set lacked even more. I enjoyed playing, but without the drunken social life, I was on the verge of quitting. Until the third Decipher set was released, Call To Arms. Something about the Dominion in Second Edition grabbed me unlike anything before, and the Dominion remain, to this day, my favourite affiliation. Even more than Khan! 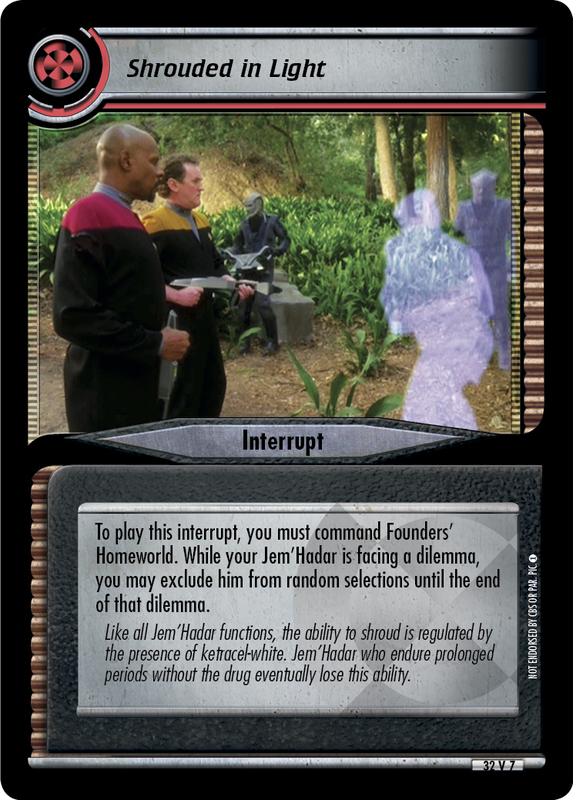 And this is how the rambling above relates to the spoiler today – a card representing Call To Arms, Shrouded In Light, featuring the Jem’Hadar ability yet to be featured on a 2E card. Another great interrupt for the Dominion, while facing a dilemma you may exclude that personnel from any random selections. Send through another Jem’Hadar while facing Personal Duty or An Issue of Trust, protect your expensive Jem’Hadar from a Hard Time… so many possibilities. It goes without saying to combine this interrupt with Arak'Taral, Suspicious Second and Remata'Klan, Unit Leader. The only drawback of this card? I won’t be able to use it at the British Nationals 22nd November.